It doesn't really matter what time of the year it is, down in southern Australia you always get some cold days, even in summer, and there’s nothing more delicious than a bowl of flavorsome, hearty soup. This one ticks all the boxes – meat, vegetables, pasta and lightly creamed, and a main meal in a bowl. What more could you want. This soup could be easily made when camping; you just need to be organized and have all the ingredients you need on hand. Served with some lovely fresh bread, this soup was liked by all!! 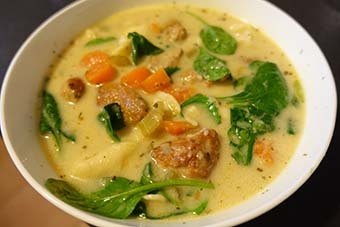 Put in enough sausage, and even blokes who don’t like soup that much will enjoy it!! • Remove and set aside. • Add a little more oil, heat, and then add the onion, carrots, celery and garlic and sauté over a med/high heat until the onion has softened. • Return the browned sausage pieces to the pan, along with the Italian seasoning and stock. • Bring to the boil, then reduce the heat, cover and simmer gently for about 20 mins. • Taste the soup and if you think it needs more flavor add a beef or chicken stock cube dissolved in a little hot water, or use the concentrated stockpots and add straight into the soup and stir until dissolved. • Add the tortellini and mix through. • Bring to the boil again, then reduce to a simmer, partially cover and cook for another 5 minutes or more until the pasta is cooked to your liking. Don’t over cook it or it will fall apart. • Add the cream and stir through. • If you want a thicker soup, then add the cornflour/water mixture and stir through and heat until thickened. • Adjust the seasoning to taste. • Just before serving add the spinach, pressing down into the liquid to submerse the leaves and cook for a few more minutes until the leaves have wilted. • Serve with some crusty fresh bread. 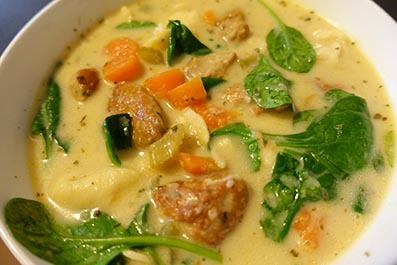 Viv’s hints: Italian sausage gives this soup a robust flavour, but you can substitute it with chicken, pork or beef sausages. A friend who gave this soup a try even thought of using mini-dim sims. If you don’t eat this soup the day you make it, the soup will thicken as it cools and as the tortellini absorbs more liquid. When reheating you may need to add a little more stock and/or cream to get the desired consistency of the soup you want. Don’t make the mistake, as I did, of adding more tortellini than suggested. It will take over the soup!!! Note: Italian Seasoning is a mix of oregano, marjoram, thyme, basil, rosemary and sage, basically. So if you don’t have a jar of seasoning handy, add any of those herbs to taste.